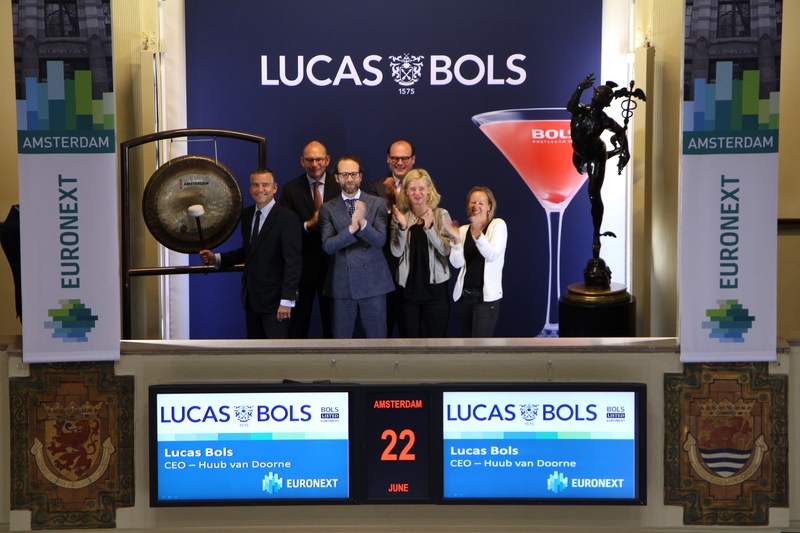 Lucas Bols (BOLS) celebrates its first year of listing at Euronext Amsterdam by sounding the gong. 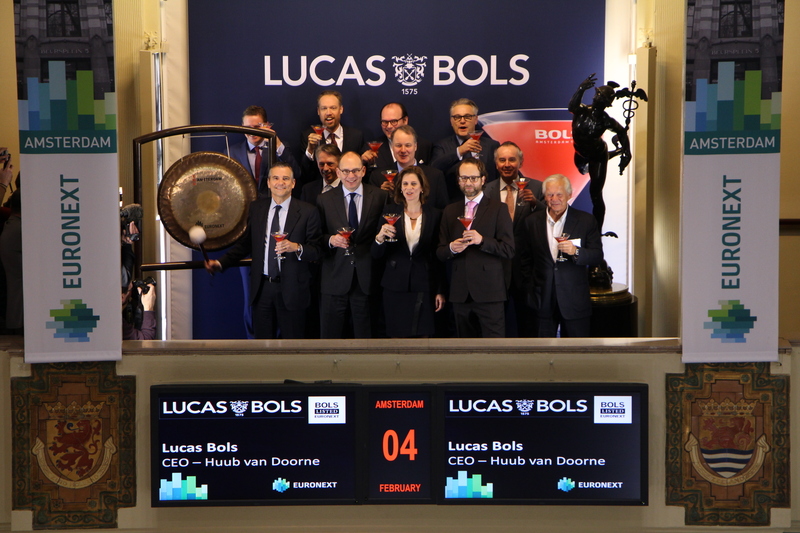 Huub van Doorne, CEO Lucas Bols, marks this occasion by sounding the gong to open trading. Huub van Doorne: "Our mission is to create great cocktail experiences worldwide. The passion with which Lucas Bols cocktail operates on the international market is also seen and appreciated by the financial markets. The listing offers us an additional platform to position ourselves even better. The share of Lucas Bols, with a broad shareholder base of both private and institutional investors, can look back on a successful first year. " Lucas Bols is the world's oldest distilled brand and one of the oldest active Dutch companies. Over the past 440 years, Lucas Bols became the expert in the art of distilling, mixing and blending liquors, jenever, gin and vodka. The Lucas Bols portfolio consists of over 20 premium and super premium brands that are used as a base for cocktails at cocktail bars all over the world. Lucas Bols's products are sold in more than 110 countries worldwide. CEO of Lucas Bols, Huub van Doorne, opens trading to celebrate the inclusion of Lucas Bols in the AScX Index. The AScX index is composed of 25 funds that trade on the Euronext Amsterdam exchange and that rank 51-75 in size. The inclusion in the AScX index follows Lucas Bols’s listing on 4 February 2015. 04 Feb 2015 EnterNext welcomes Lucas Bols N.V.
Amsterdam - 4 February 2015 – EnterNext, the Euronext subsidiary designed to promote and grow the market for SMEs, today welcomed Lucas Bols N.V. on the Amsterdam exchange of Euronext (ticker code: BOLS). Lucas Bols is a leading global spirits player with a unique Dutch heritage including Bols, the world’s oldest distilled spirits brand, dating back to 1575 in Amsterdam. Building on 440 years of history of mastering the art of distilling, mixing and blending, the company today has more than 20 brands across a range of spirits products, sold globally in more than 110 countries. By becoming a listed company Lucas Bols is one of the world’s oldest listed companies. After opening, the first market price was € 16.52 per share. Based on the first price, the total market capitalization of the company was around € 206million. 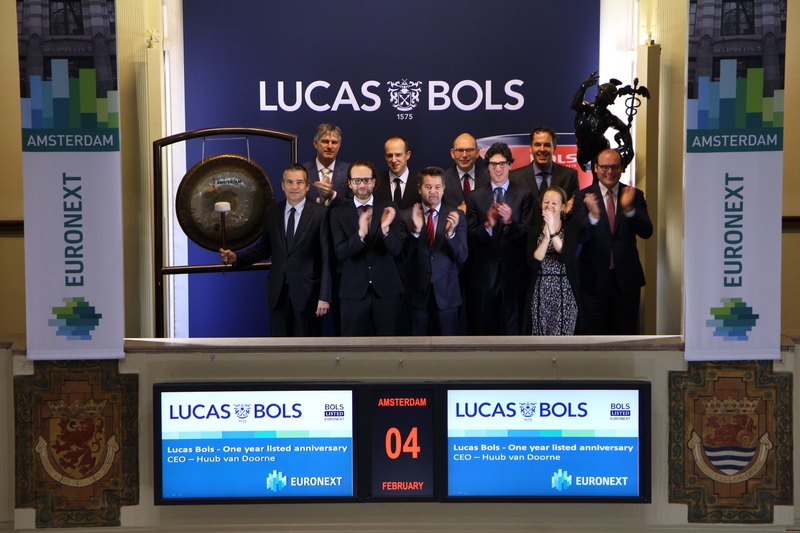 To celebrate the listing, CEO of Lucas Bols Huub van Doorne sounded the gong in Amsterdam to open trading on Euronext’s European markets. He was accompanied by CFO Joost de Vries, Creative & Communications Director Sandie van Doorne, their Supervisory Board and Maurice van Tilburg, CEO of Euronext Amsterdam. Lucas Bols CEO Huub van Doorne celebrates the company’s listing by sounding the gong. He is accompanied by CFO Joost de Vries, Creative & Communications Director Sandie van Doorne en their Supervisory Board. Lucas Bols is the world’s oldest distilled spirits brand and one of the oldest Dutch companies still active. Building on its 440 year old heritage dating back to 1575, the company has mastered the art of distilling, mixing and blending old recipes with new flavours for its portfolio of premium and super-premium brands. Lucas Bols’ owns a portfolio of more than 20 brands across a range of spirits products, including liqueurs, genever, gin and vodka used in cocktail bars around the world. Its products are sold in more than 110 countries.